We at Outdoor Lighting Perspectives cannot believe that it is already September. You know what that means, right? The holiday season is right around the corner! We are so excited to provide homeowners with professionally installed Christmas lighting and a new product has got us very excited! We’re calling it: Starry Lights. What this short 42 second video to see what we mean. Outdoor string lights are a classic lighting design during the holiday season. 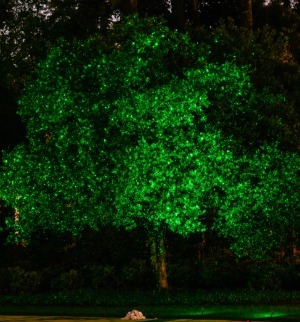 For years, people have strung them around branches in trees to make them glow. I love that affect, but it’s a lot of work! You have to get up on a ladder and then navigation a string of lights around branches and leaves. Starry lights creates the same beautiful affect without the work. The Starry Lights fixture is small and can be installed into the ground around a tree or other surface you want to sparkle for the holidays. When turned on, it shoots hundreds of small bursts of LED light onto the surface, making it look as if numerous string lights had been installed. Just like other outdoor Christmas lights, the fixture can be plugged into an extension cord. Starry Lights come in red, green, purple and blue and can made to highlight the rest of your holiday lighting. The affect is not only festive for the holidays but also fun for the whole year. Imagine sitting in your backyard surrounded by dazzling trees! We’re thrilled to include this new fixture into our existing holiday lighting offering. 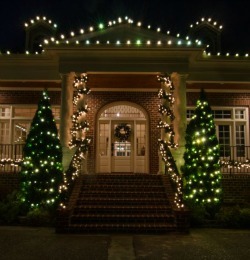 At Outdoor Lighting Perspectives, we provide full service outdoor Christmas lighting to our clients. We design and install the system so that you don’t have to go up on an roofs or spend hours hanging lights. Instead, you can sit back, relax, and simply appreciate the final look. After the holidays are over, we’ll come back to the property and take down the lights as carefully as we put them up. Additionally we store all of our clients’ holiday lights in our facility so that we can test each bulb before next year’s Christmas lighting installation. Take some time and look at some of our favorite lighting installations in our Christmas Lighting Gallery! If you’re interested in discussing your lighting needs, please reach out to your nearest Outdoor Lighting Perspectives location! Outdoor Lighting Perspectives is a trusted commercial lighting company, providing outdoor lighting for a variety of industries. From restaurants, hotels, B&Bs and more, we have lighting solutions to suit your business’s unique needs. Illuminate your outdoor spaces in a whole new way, and draw in customers like never before. Want to see what your hospitality lighting will look like before it’s officially installed? We provide complementary lighting demonstrations to give you a sneak peek of what your business could look like. We’ll work with you to create a custom plan for your lighting that matches your needs and your budget, and then we’ll put up a display for you to see. If any adjustments need to be made, we’ll complete them on the spot to ensure your satisfaction. Our hospitality lighting company utilizes energy efficient LED lights to illuminate an area without exhausting your funds. If you’re looking for a cost-effective way to brighten your outdoor spaces, this is a great opportunity for you. LED lights are fully customizable, with options to change colors, lower intensities, adjust tones, and much more. Ask about our remote lighting controls to learn more. If you already have lighting around your business, we may be able to upgrade it without completely replacing the fixtures. We have LED retrofit kits that work with nearly every lighting solution on the market, so we could enhance what you already have and save you even more money on commercial outdoor lighting. 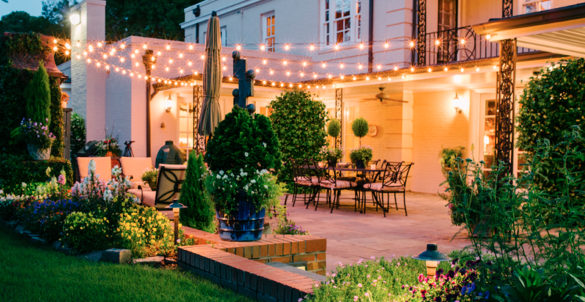 We specialize in providing outdoor lighting for the hospitality industry. If you have an event center, hotel, restaurant, or similar establishment, we can provide the perfect lighting to make your guests feel cozy and comfortable. 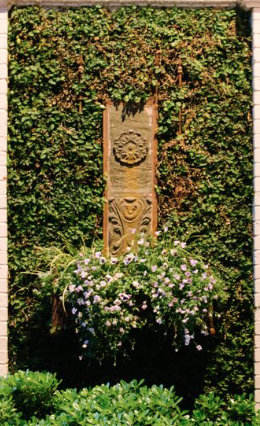 Accentuate the landscaping in your courtyard or add romance to an outdoor seating area. Whatever the case may be, Outdoor Lighting Perspectives is here to make it shine. Contact us today to schedule your complementary quote with a commercial lighting expert. We will come out to your property to assess your needs in person. Together, we will design the perfect lighting scheme for your business and provide you with years of illuminated enjoyment. October. The month when the leaves change, the days get shorter and nights get longer. It’s alsoNational Outdoor Lighting Month, a month dedicated to raising awareness on the importance of professionally designed and installed outdoor lighting. Founded in 2013, this year the program focuses on event lighting and outdoor Christmas lights. Trees, trees, trees. When designing a stunning holiday lighting display, you can’t forget the trees! They make big impact when lit well. String lights are the most common way that homeowners illuminate their trees for Christmas. 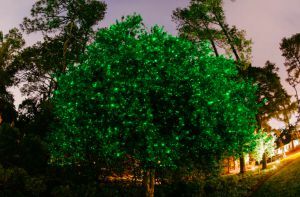 They can be wrapped around leafless branches, or wrapped around full evergreens for the perfect effect, but that’s not the only way trees can be lit for Christmas. Outdoor Lighting Perspectives’ Starry Lights installation shoots hundreds of LED bursts to the illuminated surface from one small fixture. Available in numerous colors, it’s a fixture that can be used all year round, be it for an outdoor Christmas lighting display or simply for a fun addition to your backyard dinner party. Snowfall lighting is also a popular tree lighting technique for the holidays. As the name implies, it makes it look as if the snow is falling through the tree branches. Small LEDtubes are hung in the branches then the light “drips” down the tube to create the snow effect. Another area you simply cannot forget at the holidays is the entrance of the property. It’s the time when we most often entertain friends and family! Using lit wreathes and garlands around the door or porch columns, your home is sure to look beautifully inviting for the season’s visitors. If you have question on lighting your property for the holidays, please reach out to your nearest Outdoor Lighting Perspectives office. Strings lights are synonymous with indoor and outdoor Christmas lighting, but did you know they are becoming a favorite fixture for permanent installations as well? Homeowners as well as business owners are looking to increase the ambiance of their properties, and string lighting a fun, different way to do it. To be clear, we aren’t talking about the string lights you buy at any store around the holidays. These high-quality, professional-grade lights are designed to be outside and withstand the elements for years to come. Holding them in your hand you can feel the difference. They’re heavy and need a strong cord to hold it all together. At Outdoor Lighting Perspectives, we design, install and maintain custom outdoor and landscape lighting systems. The clients’ needs are of utmost importance. What are they trying to achieve with light? If the answer is to create a beautiful, relaxing place to enjoy their backyard, string lights may be of interest. Take this backyard for example. It has a large open space patio with surrounding porches that they needed to light. We installed path lights around the patio, but it needed something more. Instead of spotlighting the patio, we decided to add some whimsy and romance with string lights. Four strands ofLED string lights were hung from the porch eaves to a stunning outdoor fireplace. Not only does it look spectacular, but the lights provide enough illumination to light the entire space below. But string lighting isn’t just for residential properties; they make sense for some commercial and hospitality lighting projects, too! Whether it’s an outdoor space at a hotel or a unique way to light an entrance to a mall, this application and unexpected and fun! 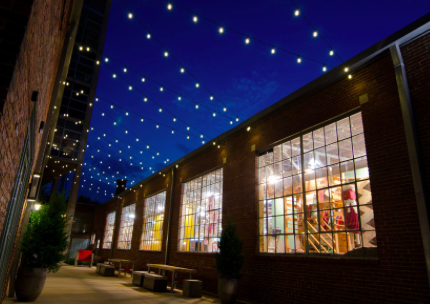 This industrial building, for example, hung string lights outside to make the space more inviting for passersby at night. Doesn’t it look great? If you’re interested in string lighting or any other outdoor lighting application, please reach out to one of our locations. We’ll work with you to design the perfect system with your needs, tastes and budget in mind.